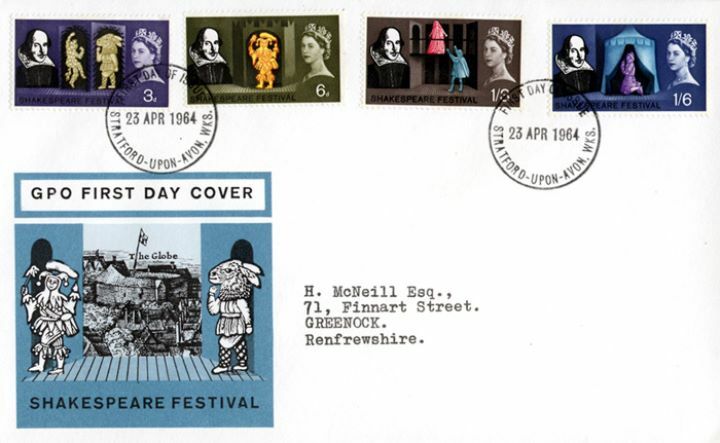 The above Royal Mail Shakespeare Festival stamps were issued on 23 April 1964 by Royal Mail and feature the following stamp designs: 3d Puck & Bottom - A Midsummer Night's Dream; 6d Feste - Twelfth Night; 1/3d Balcony Scene - Romeo and Juliet; 1/6d Eve of Agincourt - Henry V; 2/6d (non-phos. only) Hamlet contemplating Yorick's Skull. The The Globe first day cover with the Stratford upon Avon FDI Postmark postmark has been produced by Royal Mail/Post Office and features these stamps which can make a very collectible and lovely gift.